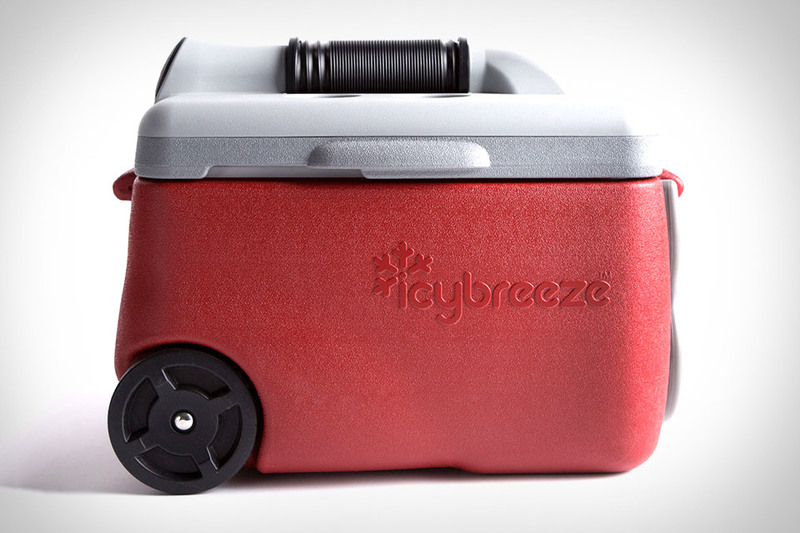 When it's hot outside, coolers are a must-have to keep your drinks and fruit cold. But what about keeping yourself cooled off? The IcyBreeze Air Conditioner Cooler does both. Thanks to a built-in rechargeable battery and a powerful 3-speed fan, this ingenious invention takes cool air from inside the cooler and sends it in your direction using a stay-put hose and integrated vent. It also offers standard features like dual lift handles, a pull handle and large wheels for dragging it behind you, two cup holders built into the lid, and a drain. Whether you're at the pool, the beach, the lake, or the ballpark, it's an ideal summer companion. Hammocks are great — no one's arguing against that — but when you try to pile a bunch of people into one, you start to run into some limitations: weight restrictions, friends flopping on top of each other. But the Mega Hammock is made for sharing with friends, capable of comfortably holding as many as three people. It's made by an FAA-certified parachute rigger, and constructed from coated ripstop nylon, nylon thread, and durable webbing, so you know it's made to hold plenty of weight. Each handmade hammock comes made-to-order, and can be customized in a range of sizes and colors. Summer lounging may never be the same. Those looking to explore the far reaches of the sea need something more than just flippers to get them around — they need something like the Tusa Evo Sea Scooter. This powerful underwater chariot boasts a maximum speed of 2.6 mph and a maximum depth of 230 feet, while offering precise changes in speed thanks to rotational speed adjustment. Other features include a 3-speed propeller with pitch and angle adjustment, an LED battery life indicator, and saddle wings that let you pull up to three divers with a single scooter. When you buy handmade gear, there's shopping local, and then there's shopping local — Octovo x Tilley Surfboards fall squarely into the latter camp. Individually crafted by hand in his Port Orford, Oregon shop from locally-sourced Cedar native to the region, these boards are made with rugged pacific coasts and cold water in mind. With five designs in total, the surfboards feature original graphics and paint schemes to set them apart from every other board out there. And each one comes with a custom carrying bag complete with shock-resistant padding, waterproof materials, leather covers and handles, titanium hardware, and padded shoulder straps. When they say limited edition, they mean it. The ArcticSilver Titanium Free-Flex Rod is limited to just 2-5 rods per classification — or under 20 total worldwide — making them some of the most exclusive gear around. Features include pure titanium stripper and snake guides, a carbon-fiber based handle, a Quick-Lock reel seat, and, of course, the Free-Flex system that allows the blank to move freely within the handle, resulting in superior feel and longer casts with less effort. Sure, cooking over an open fire while you're camping can be a lot of fun, but very little beats the convenience of cooking on a home stove. With the EcoZoom Zoom Dura Stove you get the best of both worlds, combining a portable wood fire and a stable stove surface. The insulated body and metal liner help to improve the efficiency of your combustion, letting you make the most out of your heat source, while sturdy handles and a durable construction let you take it just about anywhere. Its cast-iron surface provides plenty of strength, even with heavy pots and pans, while giving you plenty of stability to cook up some serious camp meals. Just in case you can't tell from the name, the Solo Shelter is like huge, roomy tent — for one. Built using premium materials like YKK zippers, 30D polyester ripstop nylon, and DAC poles, it offers a peak head height of 42" front and rear doors, a weight of under 5 pounds, and a packed size of 6" x 15". And when it's time for bed, just unroll the sleeve, tuck your head and gear under the canopy, and enjoy your personal cocoon.